H Series Thermometer, 0-250F temperature range, 8 in stem length, plain mounting bushing. 0-250F temperature range, 2.5" stem length, 1/2 inch NPT mounting. H Series Thermometer, 0-250F temperature range, 4in stem length, 1/2 inch NPT mounting. H Series Thermometer, 0-50C temperature range, 4 in stem length, 3/8 inch NPT mounting. 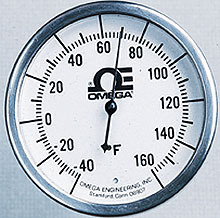 Lab/Test Thermometer 0-260C and 0-500F Temperature ranges.